being MVP: FirstBIKE & Giveaway! At Kenzie's preschool, they have "Bike Day" once a month. This month, she will be riding in style because she received the Street Green FirstBIKE for review. Out of the box, this balance bike was easy to assemble and although it is designed for children ages 22 months to 5 years, Kenzie is a wee 3 year old and I had to equip it with the lowering kit which lowers the seat to 12 inches. Within approximately 15 minutes were were ready to roll. This is a fairly lightweight bike weighing in at only 8.6. lbs and crafted of high quality materials. There are no pedals - it's all about balance. Kenzie was excited to see her green bike and wanted to try it out immediately. Once she settled in on the well cushioned saddle seat, she was off and "riding" her bike. There was a bit of a learning curve as she needed to get her balance while turning and maneuvering the bike to where she wanted to go. This balance bike has a unique rear-drum braking system which I showed Kenzie how to use just in case she ended up going faster than she wanted, she could easily stop. Who knew someone could get so excited about using a brake? I sure found out! I like that the street version has air tires making it ideal for concrete, stone or packed dirt surfaces - which is our surrounding neighborhood. These are not the cheap plastic tires with no grip. They look and feel like the tires on Hubs' mountain bike. Kenzie feels so "big kid" riding her new FirstBIKE and there is definitely many years of riding due to the easy seat height adjustment - just a turn of the knob to pull the seat up and down. I really like that Kenzie is learning how to balance and control her own movement on this bike. It will help her in the future when she is ready for a bike with pedals. I think there is a comparison between training wheels and water wings (as the swim teacher stated) - it gives children a false sense of security because when the wings are taken away, the child doesn't know what to do. Kenzie is learning the skills to banish the fear of imbalance and yes she was a bit scared in the beginning but is slowly building up the courage to zoom zoom away and eventually will pick up her feet to cruise on slight downhills! Check out my gutsy gal's vid. Buy It: You can purchase the Green Street FirstBIKE for $159.99. One Winner will Receive a FirstBIKE! Love that it is adjustable!! How fun. Would love to win one for my grandkids! I love that is is perfect for a child's sense of balance. It has the brake up at the hand bars. I also love the colors they have, very bright and cheery. I love that it has air filled tires and a hand brake just like big bikes. Love the seat height adjustment feature! My grandson Matthew would have so much fun with this! Awesome bike and and thanks for the giveaway! Adjustable! So perfect for my growing toddler. I learned the air tires are great for off road conditions! I love the hand brakes! This would be awesome to have as my DS grows. I never knew 2 years is when a child should begin learning to ride. Love the bike! I like that it helps me teach my kid to ride a big bike. I learned there's a winterizing kit where you can attach a MonoSki to your FirstBIKE and use it in winter! Very cool! This would be great! What a wonderful learning, but fun idea! I didn't know about the training wheels... "Eliminates the need for training wheels which are counterproductive and do not support proper posture or spinal development"
I learned that the frame won't scratch, splinter, swell or rust. I learned they offer a Lifetime warranty on frame & fork, and 5-year warranty on all other parts! I also learned the frame is weatherproof! I learned there are front and rear mudguards to help repel dirt and gravel! I learned that the air tires are ideal for urban areas with concrete, stone, or packed dirt surfaces. I learned that they have an optional lowering kit for younger riders. I learned about the STEERING LIMITER on the bike! great feature! I learned about the rear drum brake and the lowering kit option. I learned that T=the shape of the seat ensures a child does not slip off when riding downhill. I like that you can choose what tire is best for you basic for indoor and cross for concrete out side play. It comes in lots of diffrent colors. I love the hand brakes and that it is adjustable. Thanks so much for the fantastic giveaway! I love the idea of learning to balance first! I think that's very cool and makes so much more sense than a bike with training wheels. 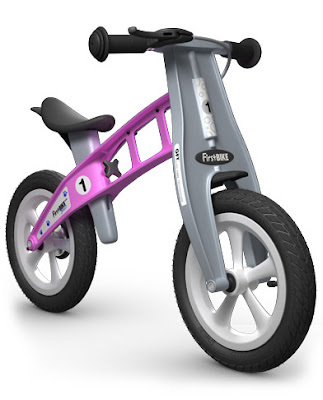 We've been looking at balance bikes for my daughter, but I love the look of this one! I learned that this type of bike helps kids learn to balance. I LOVE that you can add skis in the winter time!!! I learned that you can adjust the seat and put it together easily. I learned they have five groups of bike and tire options. I learned that there are no air in the tires! of learning to ride a bike. I like the STEERING LIMITER for little learners. I learnedt that it is adjustable, which is pretty awesome! I like that the brakes are adjustable. I want to buy one of these for the grandkids. I like that the seat will prevent my son from falling off as he rides down hills, and that there is nothing protruding from the bike that he can hurt, scratch, or cut himself on! I also love that it is so adjustable to grow with him!! I love how the brakes are up at the handle bars and how it can be used up until age 5. Love balance bikes. And this brake feature is great! I learned they offer free shipping! i learned that it adjustable, love that it's just a knob to change the seat. I like the Optional Lowering Kit, which allows kids to ride at an earlier age. I learned that they have an optional lowering kit to allow smaller kids to ride. great for off road my grandson would love to take this camping! I like that is has a steering limiter. That makes sense! I learnt that the frame won't scratch, splinter, swell or rust! That's fantastic! And so practical! I Learned They Offer A Lifetime Warranty On Frame & Fork! found some good info on Amazon about FirstBike, i like that you dont need tools to adjust the height. my H and I are not good with tools. I learned that they were designed in Germany and have a Lifetime Warranty on the Frame and Fork, and 5 years on all other parts. I LOVE that you can add skis in the winter time!!! Perfect for maine! I learned that the frame is weatherproof. I learned that First Bike has a LIFETIME WARRANTY ON FRAME & FORK! 5-YEAR WARRANTY ON ALL OTHER PARTS! How cool is that? They're designed in Germany and have a lifetime warranty of the frame and fork. I love that it grows with your child and helps develop balance! I learned that it's adjustable based on your child's age/height and there is a steering limiter. I learned they also sell really helpful accessories. I learned that it support development of a child's balance. I learned there is a steering limit, so great for little ones just starting out! there's no air in the tires! I learned that you don't need tools to make height adjustments - you just have to turn a knob! It has air filled tires and a hand brakes. I learned that the frame is weatherproof and won't splinter or rust. Also that the rear drum brakes are safer for little fingers. I learned they have many accessories for the bike, including a ski you can put on to winterize it. How cool!! I love that the FirstBIKE will grow with your child, eliminating the need to continue to buy bicycles as your child grows. Knowing it was constructed with the little ones in mind, is one thing moms do not have to worry about. I learned that the seat is adjustable and just what we need!!!!! Love that it helps them build self confidence on a bike! Great for toddlers! Love ALL of the awesome features! love that this bike has a lot of features that other balance bikes do not have. 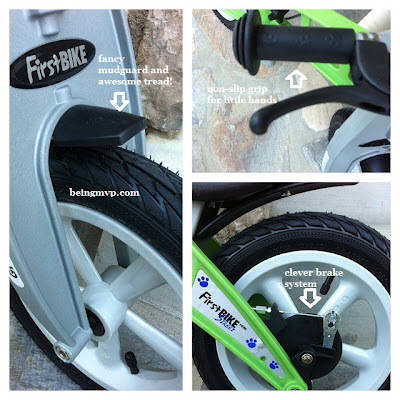 Such as the air filled tires, hand brake, curved seat, and safety grips for the hands. Looks like an awesome bike!! I learned that FirstBIKE supports the development of a child's balance and provides a no-stress method of learning to ride a bike. I love that it has so many features like a real bike like ir filled tires and a hand brake. This bike looks so amazing! It would make the perfect birthday gift for my son Sebastien who is turning two next month!! Such a clever design with kid friendly features. It would be so fun for him to ride with his friends! Love it!! I learned that it has Special non-slip "horse saddle" shape seat with tools-free adjustment provides for maximum comfort and stability. it was designed in Germany. I learned The Cross model is more attractive for boys, because the rough tread sounds a bit like a motorbike. Girls “look better” with a more subtle Street model.